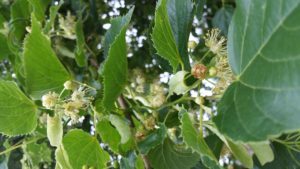 Lime trees are covered with feathery yellow-green flowers at this time of year and these are the parts commonly used by herbalists. Lime flowers make a a relaxing tea for helping with anxiety and poor sleep, but as with all herbs there’s much more to it than that. As a suitable remedy for stressed, fiery types with high blood pressure, strong pulse and red skin, it relaxes blood vessels and eases blood flow in capillaries, reducing blood pressure and supporting health of the heart and circulation. Another way that it’s used for ‘hot’ conditions is in feverish states, where its relaxing properties help the body to cool by promoting sweating (a ‘diaphoretic’ effect).